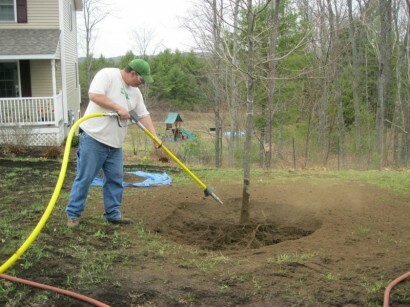 The Air-Spade tool uses highly compressed air to excavate soil and mulch away from a plant’s trunk flare and root system. This tool can be used for various tasks like: compaction relief, bare-root transplanting, trenching around and under plant roots (drainage and utility work), trunk flare excavation and girdling root elimination, and soil fertility applications. Unlike mechanical excavation with machinery or hand tools, the air spade causes very little physical injury to the plant’s root system.